In 4-quart Dutch oven, melt butter over medium-high heat. Stir in flour. Gradually stir in broth, half-and-half and wine. Stir in bell peppers and cod. Heat to boiling, stirring occasionally. Stir in shrimp. Reduce heat; simmer uncovered 2 to 3 minutes or until shrimp are pink. Stir in pesto, salt and pepper. 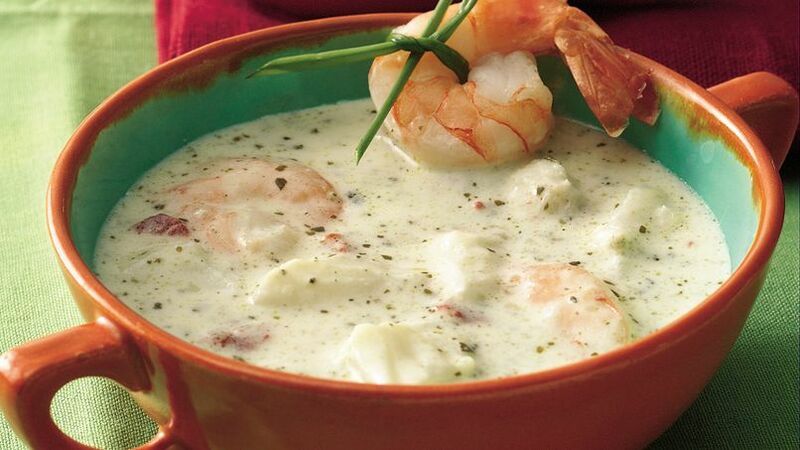 Cooked shrimp works great in this recipe, too. Just add the shrimp to the bisque and simmer until thoroughly heated. As you dish up the soup, sprinkle chopped fresh basil leaves and a little freshly shredded Parmesan cheese on each serving. Or for a simple yet "showy" garnish for each serving, tie a chive around an additional cooked shrimp.